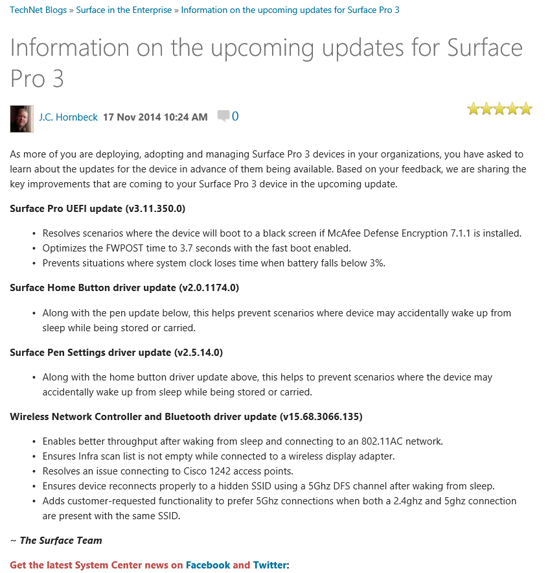 Some good news, Microsoft has announced upcoming updates to the Surface Pro 3 on TechNet. In particular, there are some WiFi updates that hopefully will fix some of the horrific issues that have plagued some customers since launch. Enables better throughput after waking from sleep and connecting to an 802.11AC network. Ensures Infra scan list is not empty while connected to a wireless display adapter. Resolves an issue connecting to Cisco 1242 access points. Ensures device reconnects properly to a hidden SSID using a 5Ghz DFS channel after waking from sleep. Adds customer-requested functionality to prefer 5Ghz connections when both a 2.4ghz and 5ghz connection are present with the same SSID. Too bad Microsoft didn’t have the common sense to post this information in the Answers Community Forums where users are begging for relief.